Melt Away Gelee 0.63 / 2.29 oz. Osmosis Colour Removes makeup easily. Won't irritate skin. Love our long-wearing makeup, but don't want to have to scrub it off and irritate your skin? 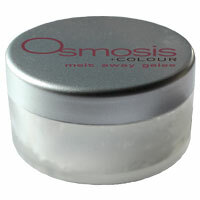 Osmosis Colour's new makeup remover, Melt Away Gelee glides on easily (just use a cotton ball or Q-tip) and watch the makeup slide right off. Finish off with your favorite Osmosis cleanser and moisturizer. I love this product. It doesn't irritate my eyes and I don't need to scrub my eyes to remove the makeup.